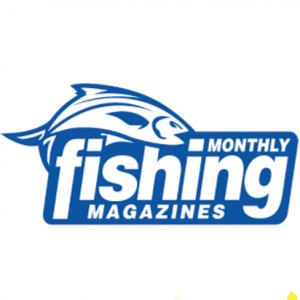 Fishing Monthly review, Dec 2017. “Boats are a big part of my life; I love them and love the things I can do with them. I enjoy spending time in other people’s boats as well, which means that every so often I have the privilege of spending time in something quite out of the ordinary, which is exactly what the plate alloy Kapten Waverider 550 is! The Waverider’s hull configuration is a radical departure from the norm (yet absolutely proven) and combines high levels of performance and stability with a highly detailed finish and very high levels of sea keeping capability. The craft is a genuine game changer in plate alloy craft design. 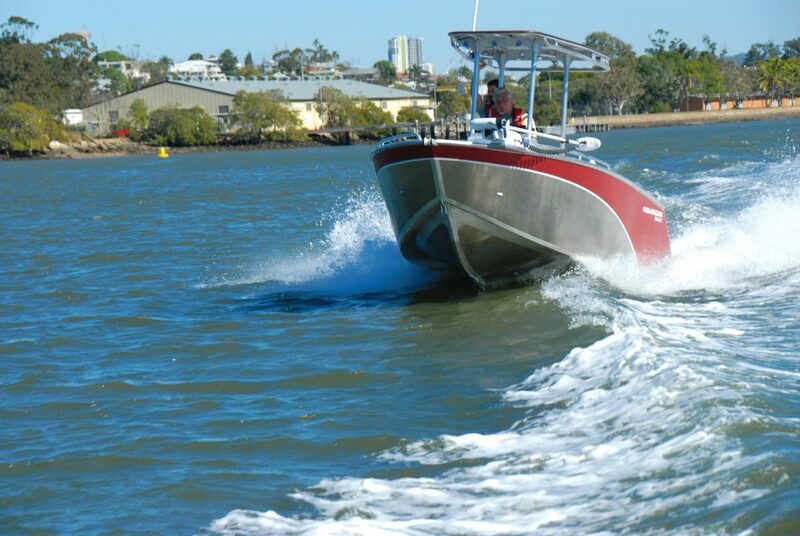 The radical hull configuration is the brainchild of Kapten Boat Collar’s Pat Jones of the Sunshine Coast. 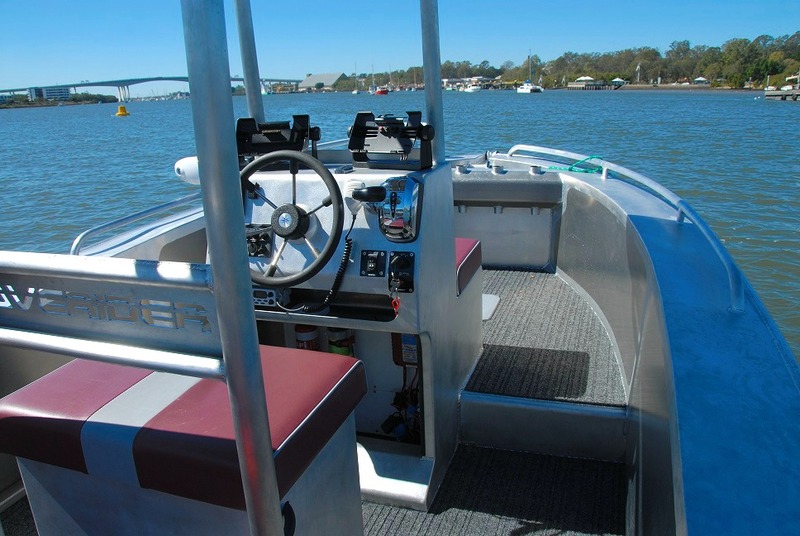 I first experienced the design and the accompanying top-shelf ride and easy performance a couple of years ago when I reviewed the [first prototype] Kapten 490 Waverider and its big brother the 610 centre console Waverider. These innovative rigs employ a vastly different hull shape, which sees the 4mm plate alloy craft having a fine entry with massive and quite steep reversed outer chines commencing somewhat aft of the entry section and continuing to the stern, in what could almost be regarded as a tri-section arrangement. While this rig is admittedly different, in practice it works very well; the fine bow reduces impact from waves while the tunnels created by the exaggerated outer reversed chines have a significant impact on ride, performance, and handling by trapping air under them underway and then really digging into the water to provide utmost stability at rest. In sea conditions off the Sunshine Coast the two earlier Waveriders were simply outstanding. While it would have been a treat to review the new 550CC in an oceanic environment, time and other constraints prevented the opportunity. Settling for the Brisbane River in lieu, we fortunately encountered some very large wash from passing tugs, ferries and other large behemoths; this allowed at least an accurate assessment of the hull’s ability to manage short sharp chop at speeds in excess of 50km/h. Mother Nature did her bit as well; the wind blew around 30 knots making for a fun day on the water! Hang on to your hat – I certainly did! In essence, the new 550CC has combined many of the very best features of the earlier models and some additional ones to make what was quite good even better. The reversed outer chines are even larger and there’s also a 17° Vee aft to further iron out chop. The reviewed rig was constructed by Aus Ships at Rivergate Place Murarrie. Surveying the craft on its custom trailer, I was taken by the outstanding Aus Ships finish, which involved a truly outstanding standard of workmanship. The welds were smoothed, polished and perfected with fit and finish absolutely top-shelf as well. A neat wrap highlighted the sides. Although the 550 Waverider was an eye catcher, I found the good looks were highlighted with practicality and fabulous performance. Pat Jones advised me there were, in fact, four models available – each an entirely custom rig as per final fit-out. The sizes available were 4.5, 5.0 (tiller steer available) 5.5, 6.0 and 6.5m centre console craft, so there’s something for everyone by the look of things. Note that while the reviewed craft didn’t have a windscreen, one would be fitted prior to the owner taking delivery. Launching at Colmslie, I was amazed at just how easily the 650kg hull was powered by the 150 Suzuki on the transom. The craft planed at a modest 2650rpm, which saw a speed of 21.5km/h recorded. Easing the ultra-sensitive fly-by-wire throttle forward to 4000rpm, I saw a speed of 45.6km/h recorded with a fuel consumption of 23.6L/h. Into the wind-driven chop, the plate Waverider felt like a virtual hovercraft, so even though the 2.8L Suzuki was brand new I kicked in a quick burst to 5000rpm to enjoy the blast of breeze at 64.5km/h while the 550 just hummed along – no fuss and no bumps whatsoever. Dropping the trim down a tad (the craft was very responsive to trim) I experienced some really impressive G-force doing hard turns just for the fun of it. I would speculate that with the 2.8L Suzuki broken in properly and the tacho touching the 6000 mark – as it certainly would – speeds around 70km/h would be quite manageable. 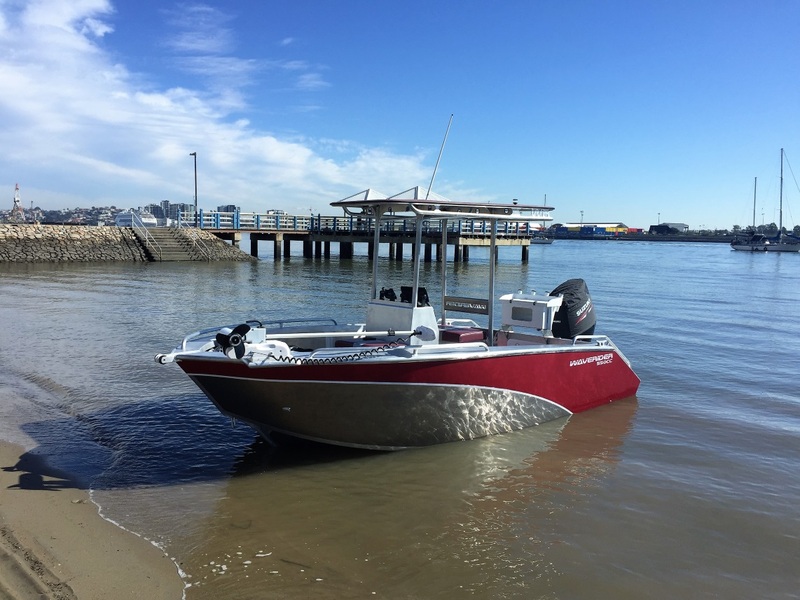 Footing’s assured in this purpose-designed offshore rig, thanks to carpet throughout and there’s plenty of room for up to five anglers to fish. A couple can work astern with two or three on the raised deck ahead of the console. It would be game on thanks to the surplus of work room and assured stability. The 700mm interior sides finished just above the self-draining floor provide a foothold when playing a big angry one, while the wide decks atop the sides also provided great brace points. The big bait station aft came with rod holders, cutting board and a window front to keep an eyes on the livies. Set into the transom was a tackle locker with several drawers while additional rod holders were near the bow. There were storage compartments set within the front floor, beneath the front seat and under the console. 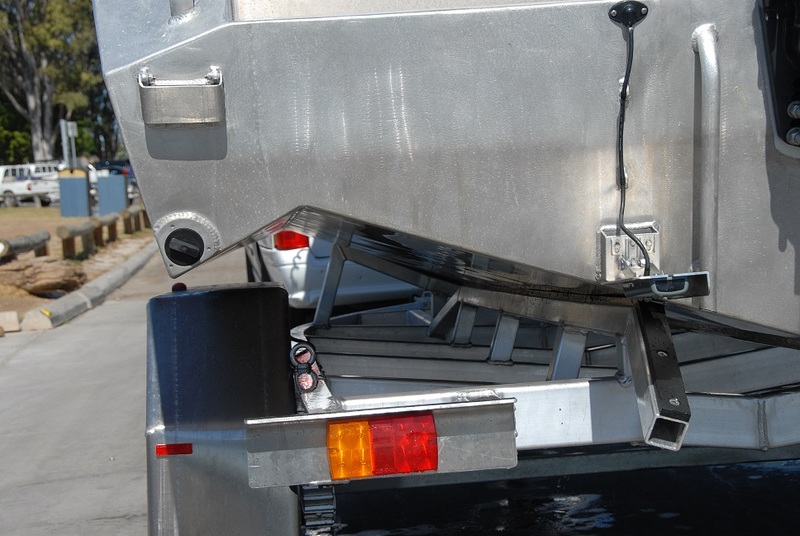 Additional storage is just one of the many options for a buyer to consider along with installation of an electric bow mount, as a Water Snake 80lb thrust was installed on the reviewed craft. The hub of the craft was the neat console under the big T Top with a bench seat for the skipper and a mate placed to ensure the dash and engine controls were within easy reach. The simple and functional dash layout had a Suzuki multi-function gauge set to port with switches and other items handy, the Suzuki engine controls to port and within easy reach whether you’re seated or standing. The dash hasn’t been designed to accommodate a flush mounted sounder, so a pair of optional 9” Garmin 820 units could be top mounted. The seating comprises of paired two person benches, per the owner’s request, and the seat up front of the console certainly provided plenty of breeze in the hair underway. In assessing the Waverider 550CC I saw it as an exceptionally well-built craft with a design that, while very different, is one hundred percent functional. Ride quality and stability are the strengths of this craft and they fairly beg for an offshore run, yet there’s no doubt the high degree of care in the finish and presentation would also have great appeal to a buyer. The design is available in bow rider, runabout, half or cuddy cabin formats and can be offered in both 2D and 3D survey. The standard rating is Level Floatation; if swamped (and fully loaded with all gear) three people can stand on one side without fear of capsizing thanks to under-floor sealed compartments and the sealed foam-filled side decks running the length of the craft. The fuel capacity was 185L but can be extended to 300L for far-ranging offshore work. As reviewed with the recommended Suzuki 150 and well-designed custom trailer – without electronics – the rig would come home for $69,500. 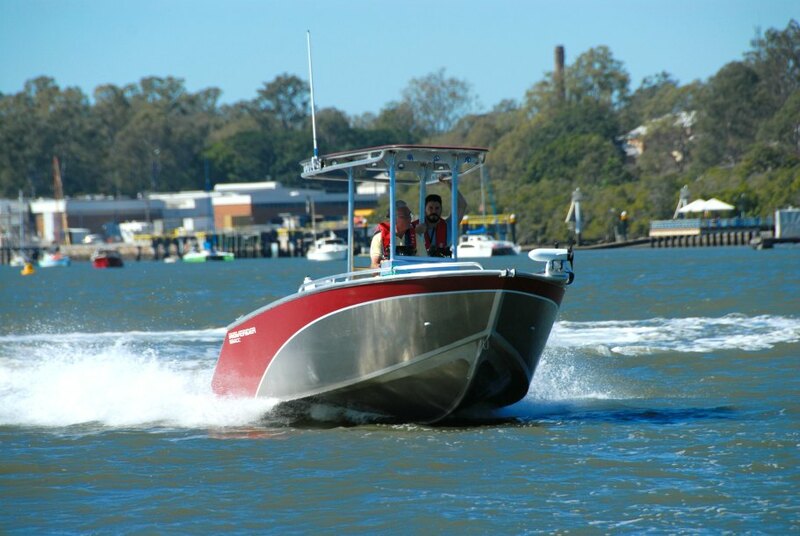 For more info, visit www.waveriderboats.com.au, call (07)5441 3636.